iTS aims to create a cooperative of professionals dedicated to constant advancement in their own education, methodology, and clinical practices so that they can provide optimum services. Incorporating and sharing each professional's wealth of personal knowledge and experiences is encouraged to promote a more global understanding and approach to any problem will always provide the best, most innovative solution. Read more about joining iTS and becoming a Independent Provider or becoming a Professional Partner. Innovative Therapy Solutions is always looking for qualified professionals interested in working in a dynamic, challenging and highly autonomous work environment. As a new developing company, one always looking for new options and opportunities, we pride ourself on our flexibility and ability to work with each professional to obtain a satisfying work setting. 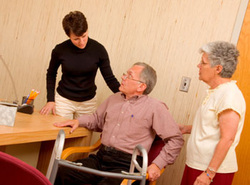 Innovative Therapy Solutions serves to meet the needs of CURRENT or WANT-to-BE independent providers by locating needs in the community, negotiating contractual agreements, coordinate other providers as needed and create education tailored to the providers needs so they may confidently administer quality services in any setting. Still working as a self-employed individual, the independent provider can utilize all the perks of being self-employed, but enjoy the freedom to do what they really want... help people! Part of your association with iTS includes education and guidance on self-employment, tax deductions, business expenses and all needs to being an independent clinical provider. -Education developed specifically on your request? -Someone else to deal with the business stuff? To truly be innovative, iTS is searching for more than just "good therapists". Comprehensive understanding of evaluation; functional, evidence based, goal focused treatment; and an understanding and appreciation of other disciplines are all key in being an innovative therapist. We'll find work for you! Want a flexible schedule? Want more independence? Looking for a change of pace? Want to be your own boss? iTS will help give you the knowledge and find the job to start working for yourself and find employment in a setting that YOU would like most.